The solemn observances of Holy Week, which recall the passion and death of Jesus Christ, begin on Palm Sunday, April 14. The Masses on Palm Sunday will include the blessing and distribution of palm branches, which play a symbolic role on this day since they were first used to commemorate the triumphant entry of Jesus Christ into the city of Jerusalem. The Most Reverend Joseph C. Bambera, D.D., J.C.L., Bishop of Scranton, will celebrate a Pontifical Liturgy at 12:15 p.m. at the Cathedral of Saint Peter, Scranton. Weather permitting, this Mass will begin in the Cathedral Prayer Garden with a blessing of palms and a Gospel reading, followed by a procession into the Cathedral. Palm Sunday Masses at the Cathedral will also be celebrated at 4 p.m. on Saturday and 6:30 a.m., 10 a.m., and 5 p.m. on Sunday. Adoration of the Blessed Sacrament begins at 6 p.m., followed by Evening Prayer and Benediction at 6:30 p.m.
Priests serving throughout the Diocese will gather at the Cathedral on Tuesday, April 16, at 4 p.m. for the Solemn Pontifical Chrism Mass, at which the Holy Oils used during the conferral of sacraments throughout the Church year will be blessed. Bishop Bambera will be the principal celebrant and homilist. Auxiliary Bishop Emeritus John M. Dougherty will concelebrate the Mass along with all priests from the Diocese. During this Mass, priests and deacons, along with lay representatives from Diocesan parishes, acknowledge the Bishop’s role as the unifying symbol for Church governance and pastoral guidance. Priests will renew their ordination promises. After Mass, they will receive the Sacred Chrism, Oil of the Sick, and the Oil of Catechumens, which are used in the celebration of Baptism, Confirmation, Holy Orders, the Anointing of the Sick, and the Rites of the Catechumenate. The deacons of the Diocese will assist in the blessing of the holy oils. The three most sacred days of the Church’s liturgical year, known as the Sacred Paschal Triduum, begin on Holy Thursday, April 18, with the evening Mass of the Lord’s Supper. During the Triduum (Latin for “three days”), the Church solemnly celebrates the greatest mysteries of our redemption, keeping by means of special celebrations the memorial of the Lord, crucified, buried and risen. Holy Thursday marks the day on which Christ instituted the Holy Eucharist and the priestly Order and gave us the commandment concerning fraternal charity. At the Cathedral, Morning Prayer will be at 8 a.m. The Pontifical Evening Mass of the Lord’s Supper will begin at 5:30 p.m., with Bishop Bambera serving as the principal celebrant. During the Mass, there will be the rite of the Washing of Feet, which re-enacts Christ’s washing of the feet of his apostles at the Last Supper. Following this Mass there will be the transfer of the Most Blessed Sacrament to the place of repose. Adoration will continue until 10 p.m., when Night Prayer will be celebrated. On Good Friday, April 19, and the following day (up to the Easter Vigil Mass), by a most ancient tradition, the Church does not celebrate the sacraments at all, except for Penance and Anointing of the Sick. At the Cathedral, Morning Prayer for Good Friday will be at 8 a.m. The Commemoration of the Passion and Death of the Lord celebrated by Bishop Bambera will begin at 12:10 p.m. This solemn liturgy consists of three parts: the Liturgy of the Word, the Adoration of the Cross, and Holy Communion. In addition, the Stations of the Cross will be prayed at 5 p.m. Good Friday is a day of fast and abstinence. Holy Saturday, April 20, is the day that the Church waits at the Lord’s tomb in prayer, meditating on his passion and death and on his descent into hell, and awaiting his resurrection. Morning Prayer will be at 8 a.m. at the Cathedral, followed by a retreat for those preparing to be baptized and received into full communion with the Catholic Church. The blessing of Easter Baskets will take place at 1 p.m. in the Cathedral. The Vigil in the Holy Night of Easter is the night of keeping vigil for the Lord (Exodus 12:42), in which following the Gospel admonition (Luke 12:35-37), the faithful, carrying lighted candles in their hands, should be like those looking for the Lord when he returns, so that at his coming he may find them awake and have them at his table. This night’s vigil is the greatest and most noble of all solemnities in the Church. Although celebrated entirely at night, this Mass of the Vigil is the first Mass of the Sunday of the Resurrection, and it is the center of the Sacred Paschal Triduum. Bishop Bambera will be the principal celebrant and homilist of the Easter Vigil Mass at the Cathedral, beginning at 8 p.m. on Saturday, April 20. This liturgy is arranged in four parts: 1) the Lucernarium (a service of light) and Easter Proclamation; 2) the Liturgy of the Word, in which the Church meditates on the wonders God has done for his people from the beginning, trusting in his word and promise; 3) the Liturgy of Baptism and Confirmation in which new members of the Church are reborn; and 4) the Liturgy of the Eucharist, in which the Church is called to the table the Lord has prepared for his people, the memorial of his death and resurrection until he comes again. 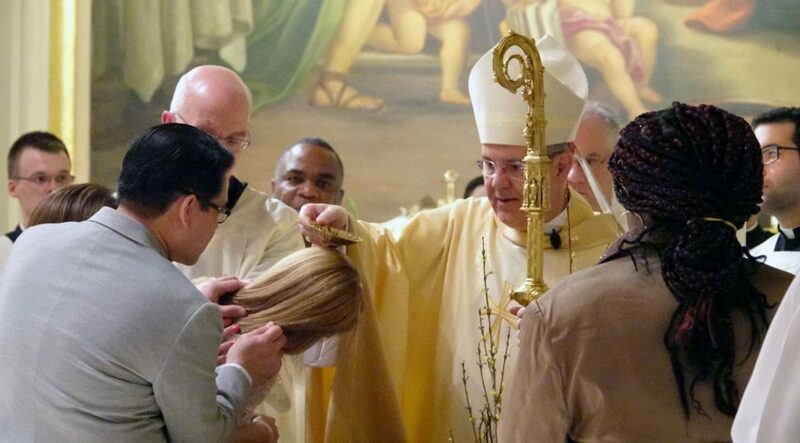 On the Holy Night of Easter, 174 people who have participated in the Rite of Christian Initiation of Adults (RCIA) will become fully initiated Catholics by the celebration of their Baptism, Confirmation, and reception of the Eucharist for the first time. This will take place during Easter Vigil Masses celebrated in parishes throughout the Diocese. They join tens of thousands of other individuals throughout the world who will become members of the Church that night. Easter Sunday of the Resurrection of the Lord is the most joyous day in the Church year. This joy overflows into the 50 days of the Easter season, which concludes on Pentecost Sunday. On Easter Day, April 21, Bishop Bambera will celebrate a Pontifical Mass at 10 a.m. at the Cathedral. Additional Masses during the day will be at 6:30 a.m. and 12:15 p.m. Since Christ accomplished his work of human redemption and of the perfect glorification of God through his Paschal Mystery, in which by dying he has destroyed our death, and by rising restored our life, the Sacred Paschal Triduum shines forth as the high point of the entire liturgical year. Therefore the preeminence that Sunday has in the week, the Solemnity of Easter has in the entire year.